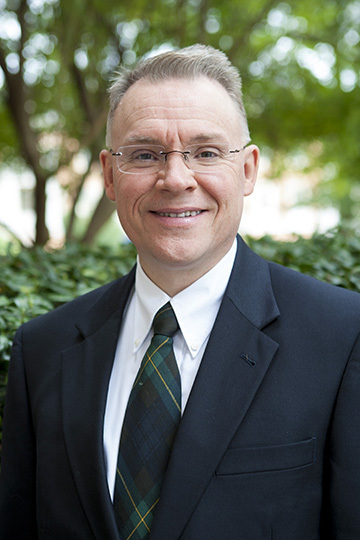 Marshall Cates, professor in Samford University’s McWhorter School of Pharmacy, has been selected for the American Association of Colleges of Pharmacy (AACP) Innovations in Teaching Award. Cates’ course, “Mental Illness and Treatment in the Movies,” was one of only three in the nation selected for this distinct honor established to identify innovative teaching and learning strategies and assessment methods. Cates was recognized for this honor at the recent AACP Annual Meeting in National Harbor, Maryland. As a recipient he was invited to present and disseminate his work as a part of a special session during the meeting. He is the first McWhorter School of Pharmacy faculty member to receive the AACP Innovations in Teaching Award. In Cates’ course, students watch an assigned movie as homework and then present on various aspects of mental illness and its treatment as depicted in the film. Students also prepare and record fictitious movie scenes that apply what they have learned about mental illness and treatment to a representative pharmacy situation. “I’m appreciative to work at a university that encourages and supports innovative approaches to teaching. The distinctiveness of this course has made it fun to teach, and I look forward to continuing to offer it to interested students for many years to come," said Cates. "It is an honor to receive this recognition, especially since there are many incredibly innovative teachers in the pharmacy Academy,” he added. Cates joined the McWhorter School of Pharmacy faculty in 1995 and has spent the past 20 years teaching psychiatric pharmacy. He has received numerous awards while at the university, including the McWhorter School of Pharmacy Teacher of the Year Award (2014, 2009, 2004 and 2000) and the school’s Distinguished Scholar Award (2013). Cates is also a recipient of the Alabama Society of Health-System Pharmacists Service Recognition Award (2014 and 2006), the Pfizer Health-System Pharmacist of Year Award (2006), and the Bristol-Myers Squibb Pharmacy Leadership Award (2005). Cates has extensive experience in psychiatric pharmacy practice, including inpatient psychiatry, outpatient psychiatry and geriatric psychiatry. His current practice site is with the Brookwood Medical Center’s Psychiatry and Behavioral Health program near the Samford campus, and he holds a voluntary appointment as a clinical professor of psychiatry at the University of Alabama at Birmingham School of Medicine. He was among the first group of pharmacists to become board certified in psychiatric pharmacy in 1996. Cates’ research and publication efforts have concentrated on psychiatric pharmacotherapy, mental illness attitudes of pharmacists and pharmacy students and pharmacy education. “Dr. Cates is so deserving of this award,” said McWhorter School of Pharmacy Dean Michael Crouch. “He has had a distinguished teaching career, and it is incredible to see how he continues to innovate and find ways to better engage and educate his students,” he added.